Want some opinions about the game before you dive right in or your curiosity sparks you as to what we'll say about it? Below you'll find a review written by the team who wrote the walkthrough. 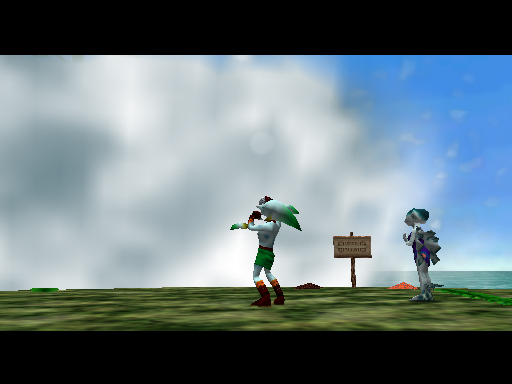 - Released in 2000, Majora's Mask was the much awaited sequel to Ocarina of Time (1998), one of the best games in video game history. While it wasn't what everyone was expecting, it stands tall as an intricate and enticing game with a lot of stand alone flavor and new perspectives on what had already been introduced. - Because this game is a direct sequel, using the same graphics engine and the like, there are a lot of similarities between it and its predecessor. This is the only game (with the exception of the Oracle Series, obviously) to do so. 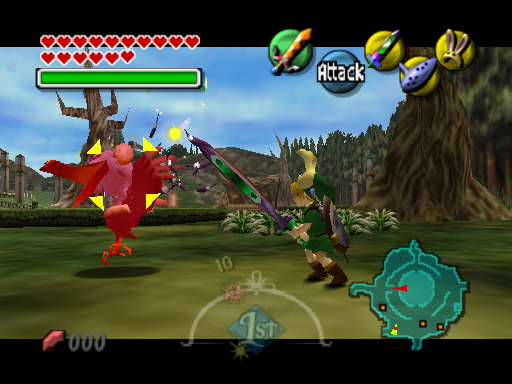 - Nintendo did a lot with it, making a lot of the colors much more lively and outlandish to fit the Termina theme. The lighting effects are astounding and much more realistic. Walking by a torch really lights up the area and there isn't much natural lighting in caves and the like (other than your fairy). Luckily, little time is spent underground, so this annoyance doesn't hinder your gameplay for the most part (i.e. having an entire "dark" dungeon). - Although everything is much prettier in this game, there are some things that really bugged me. For example, the phasing out (blurry moments) that occurred often during movies. Although it did make the game feel disorienting, it didn't add much flavor, only made things hard to make out. Every time I'd see it coming, I'd groan, "Not the stupid blurriness again!" - A lot of the same models were used in this game, which is understandable due to the fact that it would take them nearly a day to create a new one. Several of them have more expressions and fluid movements. They aren't always standing in one place (walking animations) which is a very cool addition as well. - I'd have to say though, if you were looking to play this game and don't feel like purchasing an Expansion Pack (upgrades some of the graphics), you're not missing too much. With a little choppy animation and lack of the blurriness (YES!) the game is still quite playable and in some cases, preferred. There are times though, when the colors really are quite enhanced. I'm not too nitpicky about graphics though, so it doesn't bug me too much. I'd rather be able to see in those dark areas than have my feet shadow correctly. - As with all of the games in the series, the music is superb. The theme for the Last 6 Hours before the Moon falls is simply beautiful and certainly captures the mood. Everything has been form fitted (very nicely) to this strange new land where birds steal your swords and some invisible dude wants your help. 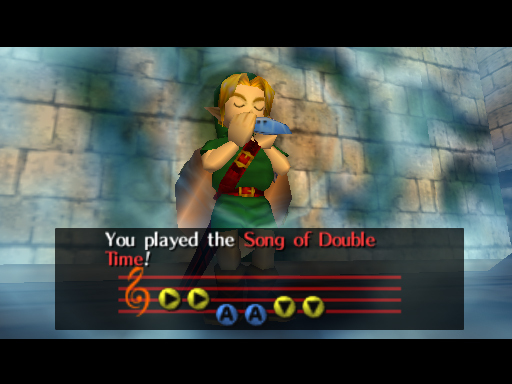 - The new Ocarina songs can get fairly annoying from being played so much, such as the Song of Soaring and the Song of Double Time. Also, Nintendo seriously got lazy with the theme song for each of the areas because it's the exact same, just had the "instruments" revamped to fit the theme. 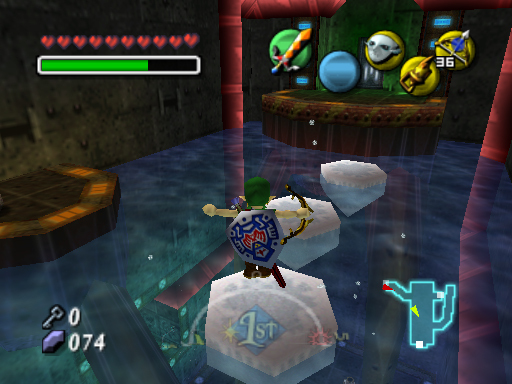 I miss the old Ocarina of Time teleportation songs (because you mixed and matched them regularly). 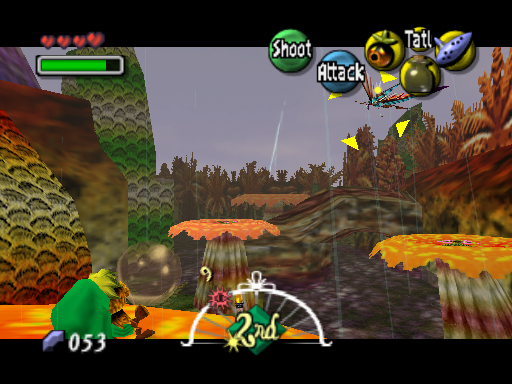 - The characters (and even enemies) had a lot more sounds, such as grunts, chuckles, the works. It truly made the experience much more entertaining and interesting. - One of the main differences in this game is that everything is forced into merely three days, after which the world is doomed. In order to save it, you must return to the past with the aid of your invaluable item from the previous title: the Ocarina of Time. - Unfortunately, there are only four temples in the entire game, which makes the game far shorter. To make up for this, there are lots of side quests that will reward you with the many more Pieces of Heart available due to the lack of boss battles. 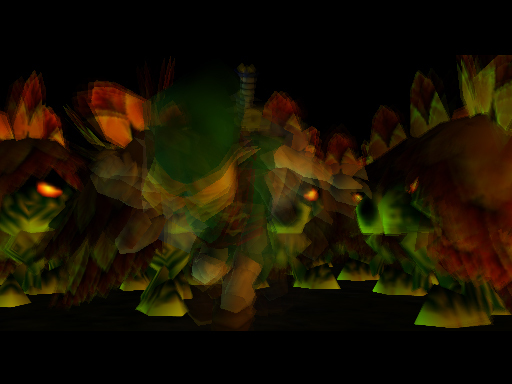 The Bosses were much more interesting, had more attacks and animations. All around, they were harder and engaging, which made the whole experience more memorable. There are two or three mini-bosses for each temple as well, which is an amazing addition. 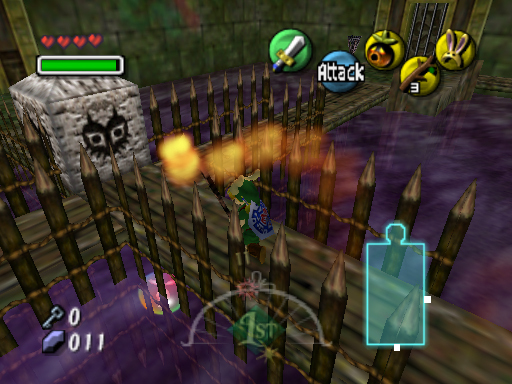 - The dungeons in this game were far better than in Ocarina of Time. They were innovative and relied more on almost cinematic advancements than small keys and moveable blocks like the previous titles. I should mention though, because of the lack of temples, there are many more quests outside that you have to complete before being able to even enter each of the temples. 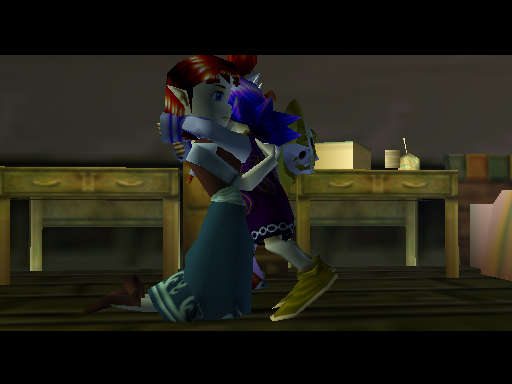 Taking us out of the dank rooms of the dungeons is quite a feat, although it can feel rather pointless trying to help a ranch girl from aliens or silencing a baby Goron's tears when the moon is about to fall. 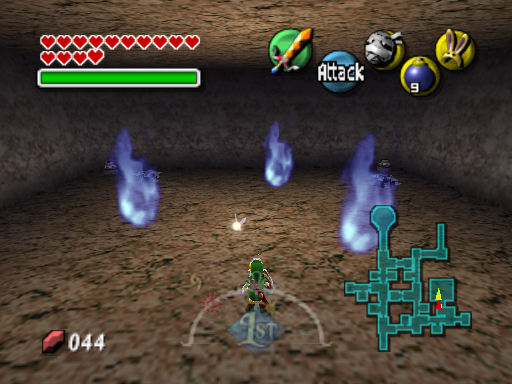 - One of the major aspects of this game is that the masks now have many mystical powers and abilities. This was hinted at in the previous title, but you never got to explore this. Now there is an entire section in your subscreen devoted just to masks, most of which merely aided in the collection of Heart Pieces or to progress through the game. This was an interesting addition in that you got items often. You rarely went with a stretch where you didn't feel like you were earning anything and you could always tell how far you have progressed through the game by merely pressing Start. - The beauty of this is that you can decide whether to just skim through the game or collect everything you can. In a way, this is where the game fails for the average gamer who just wants to play the temples. This game requires lots of waiting around and the action is spared for special occasions in a sense. - This greater reliance on items was a good and bad thing. In each dungeon and mini-dungeon, you were forced to press Start repeatedly to change your (C) Buttons for almost every room. This is good in that it added variety, but there's just so many items and not enough time to accurately use them all. - The controls in the previous title were a little choppy here and there, but they have since been refined. There was also a lot of switching between "A" and "B" being the action/cancel button depending on which item you were using or mask you were wearing. Although this did come natural after a little while, it strayed from the system set in stone and was slightly confusing at first. - The storyline for this game is strangely creepy as well as quite depressing. Not only is the world doomed, but each task you complete will amount to nothing because for the people you helped, it never happened. While you get items and masks to prove you have completed it, you can't help but feel saddened and nostalgic seeing the same people going about their lives aware of the fact they will die in three days. - Because of this unique twist, you really felt connected with each of the characters you help. It's unfortunate there isn't more depth to everyone in the game, but the select few you do help certainly leave an impression. - The Bosses in this game seemed a little forced. Most of them had only one way to truly defeat them, an entirely different gameplay mechanic than the rest of them. 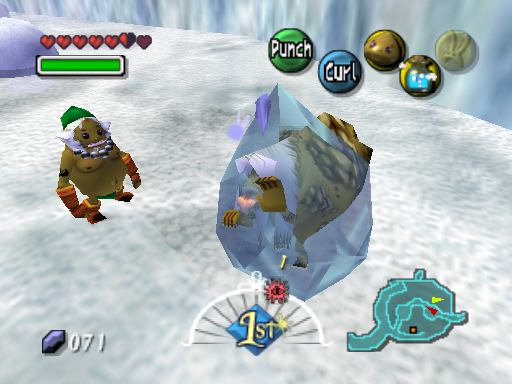 An examples of this would include Goht (Snowhead Temple) using the Goron Mask to roll after him and Twinmold (Stone Tower Temple) using the Giant's Mask to slash them to bits. While this is interesting and new, it also seems kind of patched together and certainly gets old when you need to beat the same bosses over again to complete other quests. 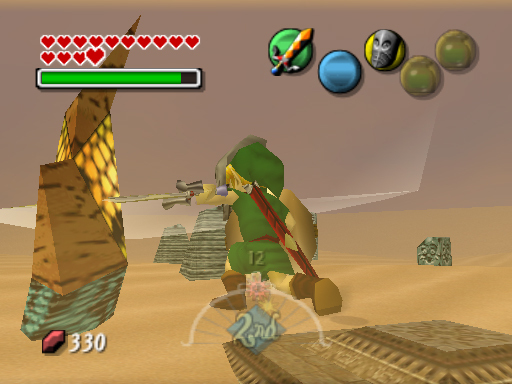 - One thing this game succeeded at was to take a deeper look at the individual races of Hyrule/Termina; notably the Deku, Goron, Zora and even the undead! 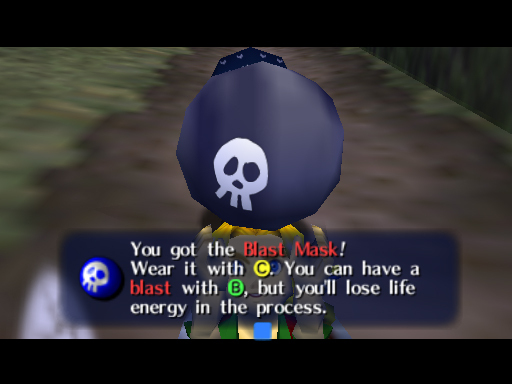 The four Transformation Masks allowed you to see the world from new perspectives, from the way characters treated you to the way you battled, each had a different vibe that flavored the game. 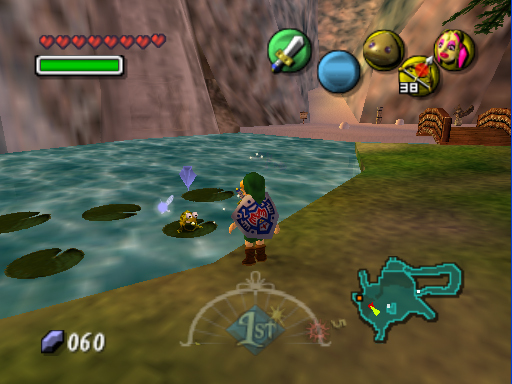 While it may not be as "epic" and "big" as its predecessor was, it has what Ocarina of Time didn't: a deeper look at the world and the characters living in it. - Beating areas in this game was a little more vindicating because new possibilities opened up, such as mini-games. The only exception to this would be Stone Tower, where nothing changed at all (other than Gibdos leaving). - The characters in this game all have specific schedules and walk around the town. At first, it can be a little overwhelming comprehending how to complete all of the quests and see everyone, but it is certainly possible. 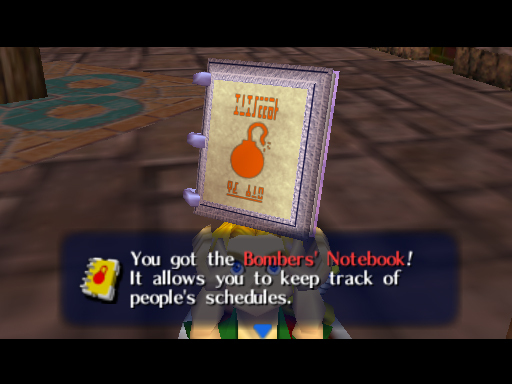 To aid you in this feat, you are quickly given a journal to keep track of them called the Bomber's Notebook. It definitely added a sense of completion and made it much easier to complete quests. Also, with Link's new facial features, it helps to bring the sense that he's actually helping people, like the hero he's made out to be. - While I would have preferred more music, we were still introduced to more beautifully conducted pieces and presented with new graphics to drop jaws of those closely familiar with the previous title. The new control schemes were excellent, if a little awkward. Nintendo brought this world to life in a unique way and absorbed you into the lives of the NPCs that stood around aimlessly before. 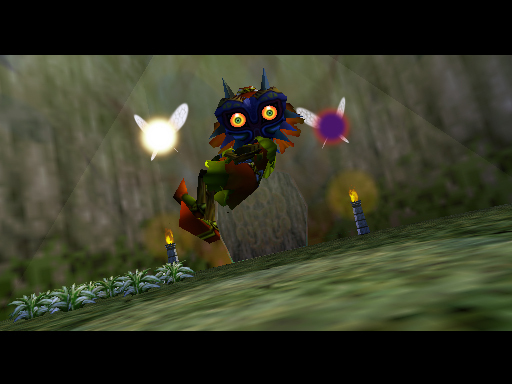 - To summarize: Majora is a wonderful game for those patient enough relive the same three days over and over again. While it may fall short for the average gamer who merely wants to play through temples, killing baddies, it opens up new puzzle opportunities and intricate looks at the characters living in this virtual world. It is one of my favored games and its temple puzzles will hold a dear place in my heart compared to some others in the series.